Setup Maker Software brings for you efficient and profitable way to generate the self-executable exe file setup of your windows application in just few clicks. 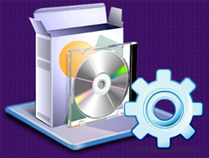 The windows installation software package is capable to create both Installation and Uninstallation software setups without alteration in the source program.Compact setup creating utility is a profitable tool for programmers to have an easy save and deployment of their programming applications. User friendly setup installer maker has fully professional working and can easily be operated by technical and non-technical persons. MSI to EXE converter provides straight forward easy solution to convert Microsoft Windows installer (.msi) setup files into executable installer (.exe) file format in a single mouse click. EXE files installation package generates powerful and professional exe setups from visual studio .NET framework installation programs.The self-executable windows installer program has user friendly graphical interface and no technical skills or prior training needed to work on software. Exe generator installation wizard is in-expensive, streamlined, easily affordable software application and a flexible setup maker program for all windows users.